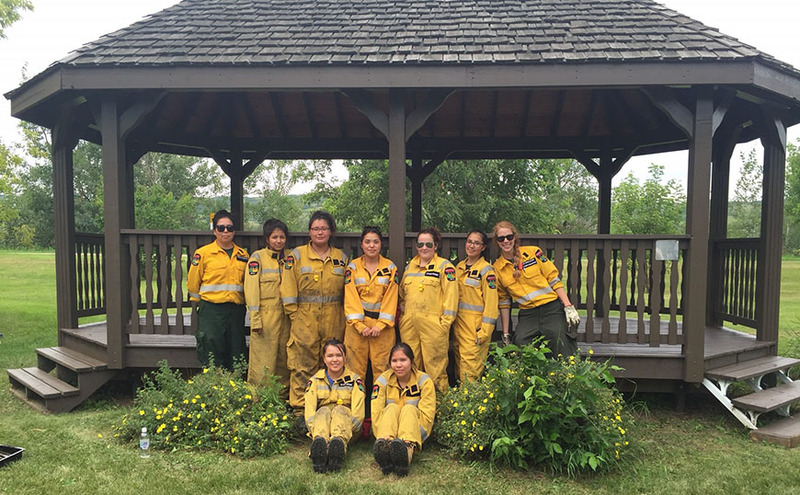 The Peace Region Junior Forest Rangers (JFRs) and other forestry staff rolled up their sleeves and undertook major renovations at the arboretum in Peace River this past summer. The large gazebo (first constructed in 2000) received a compete clean-up and a new coat of paint. Further, two damaged benches along the arboretum walking areas were also replaced . Still to go, are plans to repair and paint the front entrance way in September, before the frost arrives. On September 22nd staff from Agriculture and Forestry and Environment and Parks will team up to Celebrate National Forest Week at the Normand Boucher Arboretum. Student tours will focus on forest health, protection, native tree species and outdoor stewardship themes. Over 300 students are expected to take part at tours at the arboretum on this day. This is a Free annual community event. Our sincere thanks to all of the JFR crew members and Agriculture and Forestry staff who took part in this outstanding community project. Our arboretum, since it first opened in 1990, has become a valuable outdoor classroom for several of the nearby schools in Peace River and elsewhere. It is now a more welcoming location due to your fine efforts.